Happy Women’s Day to all the lovely ladies out there!! And this is for you… Sing out Loud!! Click here to see the video. 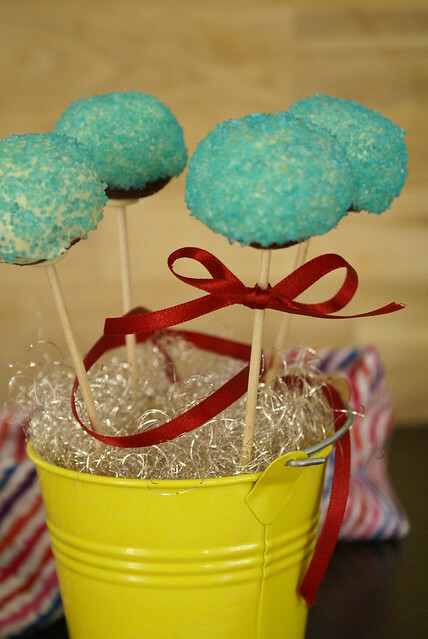 If you need something pretty on your dessert table at a party, they you must for sure add these Cake Pops. I am not the queen of CakePops, but these turned out pretty good. Let me tell you that it may take a few trails to get them right, all you need is just lil practice and lil patience. I used my leftover sponge cake for this. I do not have an exact measurement. I was not sure that I would get them right the first time, so I did not even bother to take step by step pictures. It was my luck that it clicked. But I promise a detailed post with step by step pictorial real soon. Use your left over cake, or bake a plain vanilla sponge cake (recipe here). Crumble the cake well, with out any large lumps or pieces. Add in Nutella, and form a dough. Do not add too much, just enough to get the cake mixture together and hold its shape when rolled into a ball. Put it in the refrigerator for 30 mins. Line a baking tray with a butter paper. Take out the cake dough from the fridge and make small balls (hint : use 1 leveled tbsp of dough for each ball). Put the balls in the baking tray. Freeze them for another 15 min. Melt white chocolate. Use a microwave or melt using a double boiler. Keep the sparkling sugar ready in a bowl. Dip one end of the lollipop stick into the melted chocolate and stick it 3/4 of the way into the cake balls. Do this for every cake ball and return to the refrigerator for another 30 min for it to set. 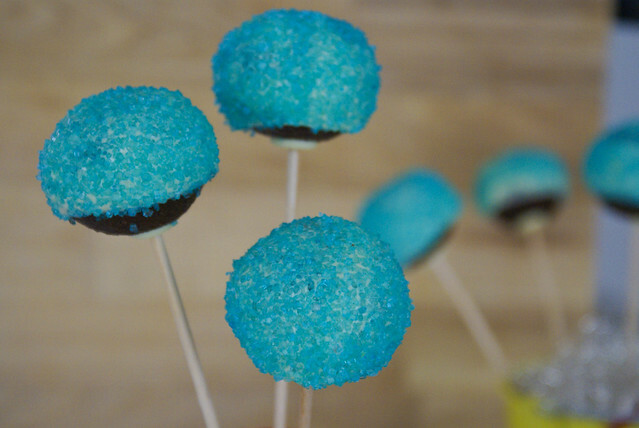 Now, holding the stick, dip the cake pop into the chocolate dip. Slowly tap the stick so that the excess will fall out, if not it will drip down the stick. And now sprinkle it with sparkling sugar. Arrange them in a small vase or in a cake pop stand. Keep them aside for 30 mins to 1 hour to set. Have fun!! Rolling the cake balls again after you take them out from the freezer gives you a perfect shape. If you do not have chocolate bark at hand, you can even use candy melts. If the melted chocolate is too thick add little vegetable oil and mix. Keep a large tray or some news paper under,when you sprinkle the sparkling sugar,it will be easy to clean up. Instead of sparkling sugar you can use any sprinkles. Lastly, this is very time consuming, so have patience. These look so yummy, Happy Women’s day to you too. 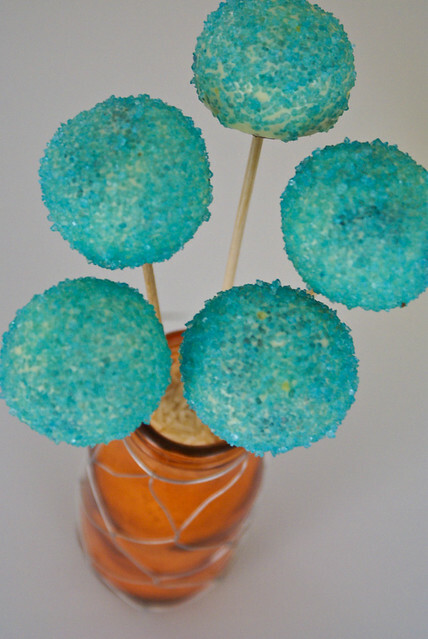 happy womens day to you too.awesome helen reddy!……the cake pops are beautiful…and would’ve tasted great. oh..these pops looks so cute, sweet and pretty, loved reading through your verses too. Well, these do pop! The pops are pretty and I know these have got to be tasty! these look seriously amazing these are so colourful and mouth watering .great job!!!!!!!!!!!!!!!!!!!! yay! 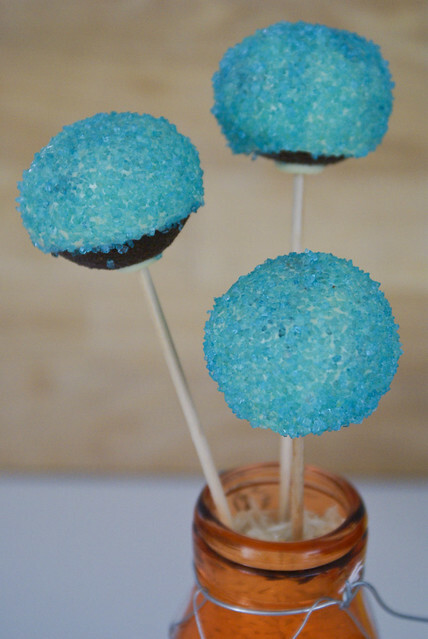 i saw again a version of cake pops , looks so good yum! great really love the colors hiih!..